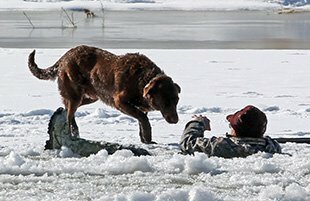 As if there wasn't enough evidence that dogs are just plain awesome, now comes the news that a man's loyal dog waited and watched for 30 minutes as the fire department rescued his owner after he crashed through thin ice on the Colorado River. The unidentified 60 year-old-man and his canine companion were out on the banks of the river for an afternoon of duck hunting. The man fell through the thin ice when he walked onto the ice to retrieve a duck. Hero dog saves baby from kidnapping, family says Nearby hunters witnessed the accident and called 911. But while they waited for help, the man's dog refused to leave the scene. Like a worried relative in the waiting room, the dog paced back and forth, trying to reach the man, who repeatedly waved the dog off, fearing for its safety. This story is just one of many heart-warming tales of animals who put their lives in danger to protect their owners. So, seriously, why are dogs so heroic and awesome? "This is simply who dogs are," Dr. Karen Overall, an Animal Behavior expert, told Yahoo! Shine. "We have had a close, cognitive, emotional and working relationship with dogs for tens of thousands of years, and we have both been changed by that history. Dogs are heroic to us because they live up to that relationship." "Dogs are genetically primed to bond with people," Dr. E'lise Christensen Bell, a board-certified Veterinary Behaviorist, told Shine. "Thousands of years of domestication coupled with a loving, healthy family can create a bond that can't be stopped by mere ice or near drowning." When help arrived, a firefighter swam out on a board to rescue the man, who was clinging to a piece of ice with one leg exposed in the 14-degree weather. Out of the water, the man was treated for hypothermia. Just after Christmas, the Colorado Springs Gazette issued a warning about thin ice to "people and pets alike." Capt. Nathan Mascarenas with the Fountain Fire Department told the paper that "the ice out there will not hold," and emphasized that both children and pets should be kept off the river. Luckily, this story had a happy ending. Back on solid ground, the man and his loyal friend were reunited. But many people are not so lucky. In Madison, Wisconsin, there were three deaths caused by thin ice just after the New Year. Department of Natural Resources conservation warden Todd Schaller had several pointers on ice safety. If you must venture out, look for clear ice, which is generally stronger than ice with air bubbles or ice covered in snow.